Our family has staycationed many times in Waikiki, and whenever we'd look down from our hotel's balcony or we'd be playing at the beach, I'd see people enjoying time on catamarans sailing across the waters off of Waikiki. A couple of weekends ago our family was fortunate to experience a sail ourselves, as we spent time on the Manu Kai Catamaran for an hour long adventure. 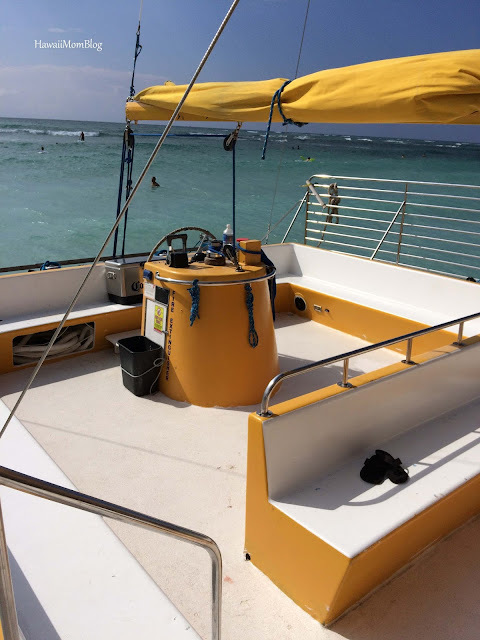 The 43 feet long, 22 feet wide Manu Kai catamran was built in 1986, and although it has been operating for several years in Waikiki, it has recently undergone an ownership change. 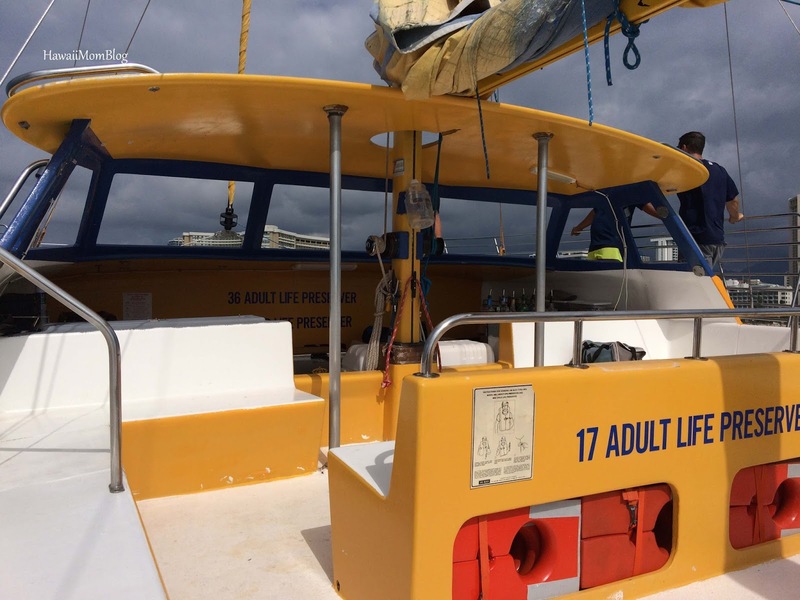 In December the new Manu Kai launched different types of sails to appeal to a wider customer base, and one of those sails is the Educational Sea Life Tour. The day of our sail we were experiencing Kona winds, which would mean a bumpy ride, but I was prepared with my ginger candy (to ease any motion sickness), and crossed my fingers I would be fine for the next hour. We boarded the catamaran, and soon we were sailing out to sea. 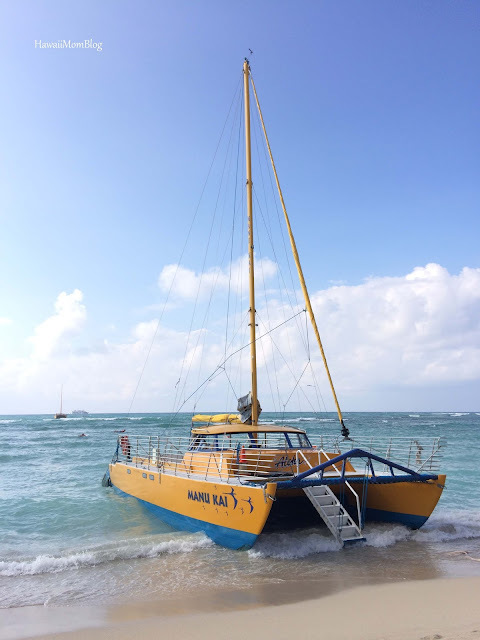 The captain navigated the catamaran safely through the surfers and swimmers, announcing by voice and the blowing of a conch shell that the catamaran was coming through. Before long the hotels of Waikiki grew smaller, as we made our way farther out into the ocean. Just a few minutes into our cruise we saw honu (turtles). 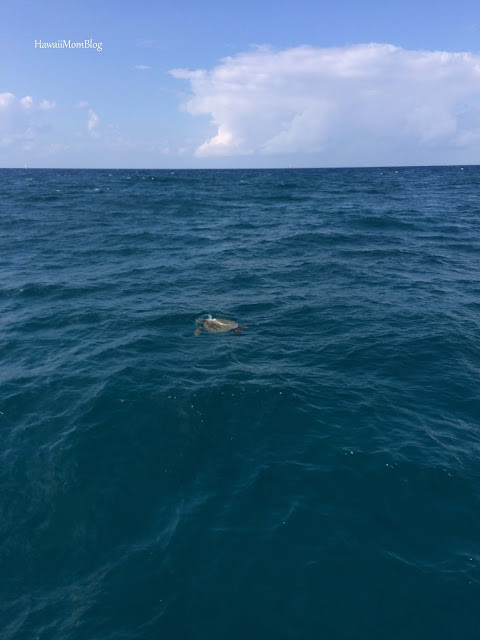 We didn't get to see other sea life, but we learned more about the honu and turtle canyon (where most of the honu can be seen), navigating by stars, other sea life that can be found off of Waikiki, and about the ocean in general. 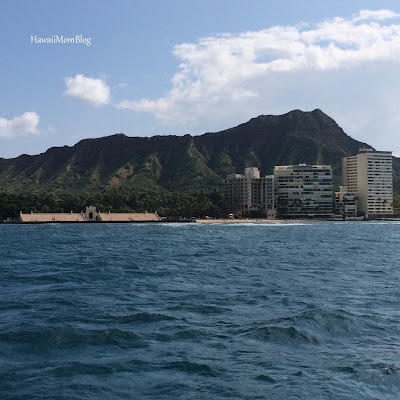 We sailed closer to Diamond Head, and got a great a view of the Waikiki Natatorium War Memorial. If you book an Educational Sea Life Tour and Akoni is your guide, be sure to ask him how Diamond Head got its name! The hour seemed to go by very quickly, and although it was a fairly rough ride because of the windy weather, the sun was out, the views were incredible, and it was a really fun ride! 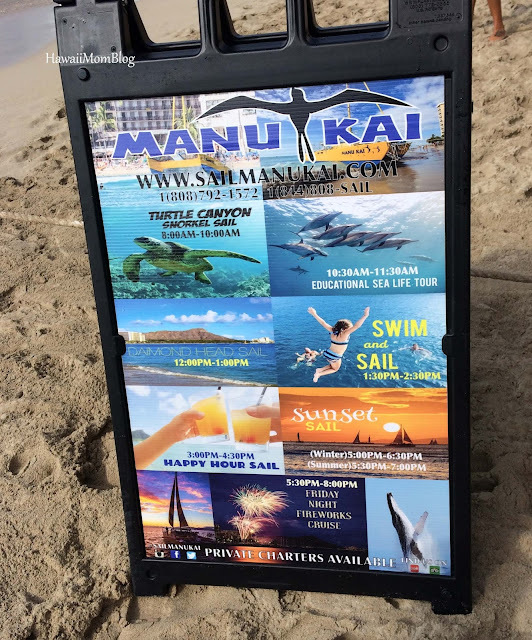 Manu Kai offers many other types of tours. There are tours in which you can snorkel, swim or simply watch the sunset. The Educational Sea Life Tour is popular with families, and the Friday Night's Fireworks Cruise is very popular with adults, although kids do go on those tours as well. Onboard the Manu Kai is a full bar, with juice, drinks, and cocktails ranging from $2 to $7 (they offer a Happy Hour Sail where drinks are 50% off!). And in case you're wondering, especially if you book a lengthy cruise - restrooms are available on the Manu Kai. They're tiny restrooms located beneath the seats, and it's good to know that they're there, especially if you've had a cocktail or two. Our family had a really nice time aboard the Manu Kai. Although weather conditions weren't perfect, thankfully the ginger candy worked for me and motion sickness didn't hit me (although the last 10 minutes or so my middle son did curl up in my lap - next time I will make sure to give all of my kids ginger candy!). 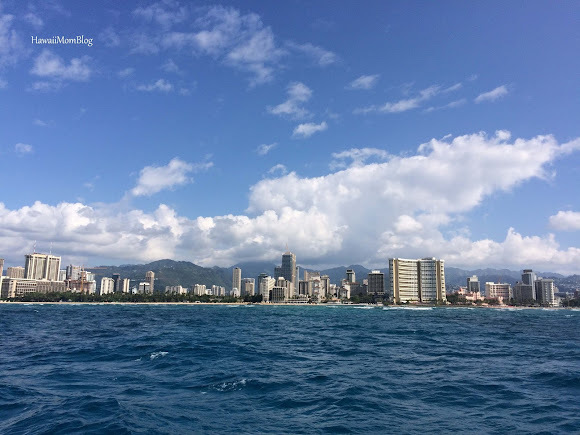 It was exciting to see all the honu swimming by, and I especially loved getting a different view of Waikiki. We're always at the beach - it was neat to see the shoreline from out in the ocean! However, what stood out for me the most about our cruise on the Manu Kai was the crew. 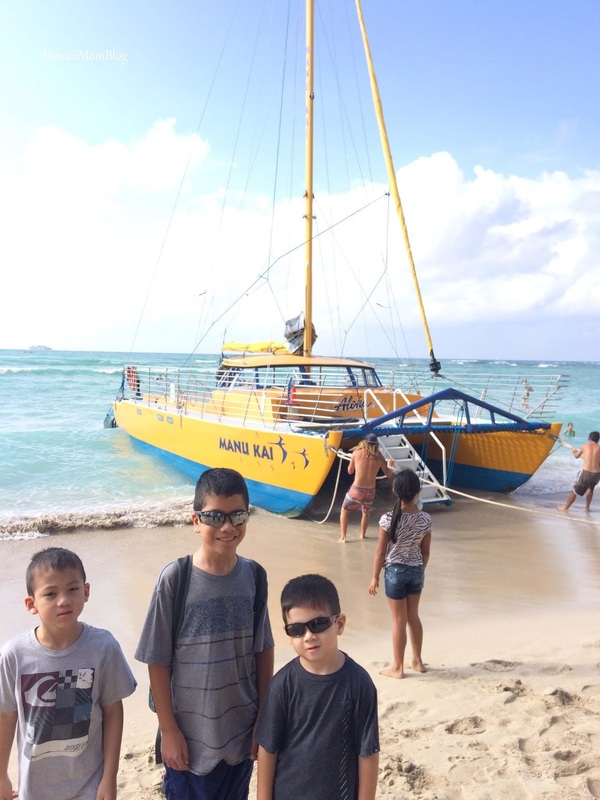 Everyone onboard really exuded the aloha spirit, and I was impressed with how caring they were for my kids. 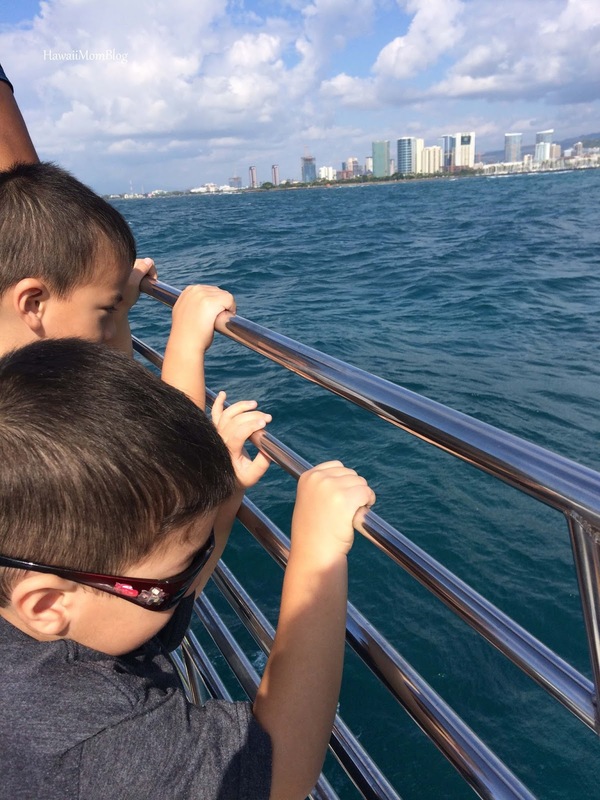 They held my kids' hands as they walked around the boat, ensuring their safety; they asked my kids questions and kept them engaged; they essentially treated them like `ohana! After the sail was done we were brought back to shore with smiles on our faces (well, maybe except for my middle son because of his motion sickness), and fond memories of our time aboard the Manu Kai, and it's all thanks to the amazing crew! For more information on Manu Kai's activities, click here. Kama`aina and military discounts available, but must inquire in person at the beach. Parking: We parked at the Royal Hawaiian Center, where we had lunch after our sail. With validation parking was $4 for three hours. Thank you to Manu Kai for hosting our family. Gratuity was paid on our own.